Amit V. Sonurkar from Hinganghat, B.E. - B.Tech Graduate. 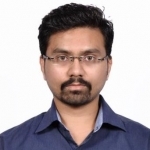 Amit V. Sonurkar is VLSI Design Fresher and currently have no work experience. VERILOG HDL PERL ASIC DESIGN DIGITAL CIRCUIT STA ASIC FRONT END DESIG..
are one of expert skill area's of Amit V. Sonurkar . Amit V. Sonurkar is working in IT Hardware industry.